The leading M&A advisor to the construction materials industry. 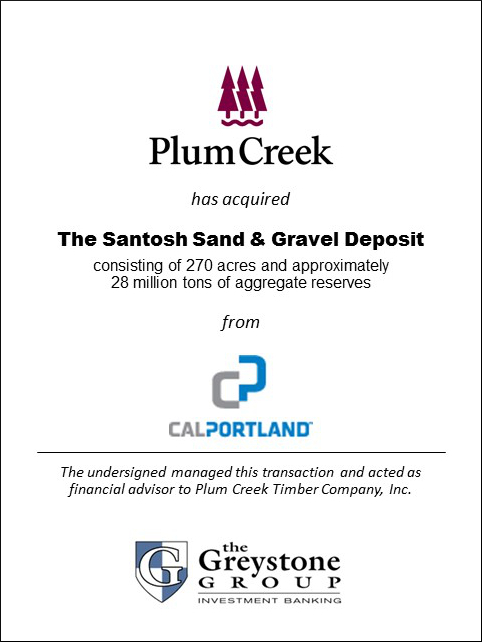 SAN DIEGO (June 30, 2011) – The Greystone Group announced today that it advised Plum Creek Timber Company, Inc. (NYSE: PCL) in its acquisition of its interest in approximately 270 acres of land containing approximately 28 million tons of aggregate reserves from CalPortland Company. The sand and gravel deposit is located near Portland, Oregon and will continue to be operated by CalPortland. Plum Creek is among the largest and most geographically diverse private landowners in the nation with approximately 6.4 million acres of timberlands in major timber producing regions of the United States and wood products manufacturing facilities in the Northwest. CalPortland Company is a major producer of cement, concrete, concrete products, aggregates and asphalt in the western United States and Canada. Founded in 1891 with the principle of providing unsurpassed quality, CalPortland remains a leader in the industry through its commitment to quality, customer service, technical support and environmental leadership. The company maintains its headquarters in Glendora, California and operates in the Western U.S. and two Canadian Provinces.